Ginny is a mixed golden retriever who now lives with Alan's parents. We found her in Caroline County, Virginia while riding on the Bike Virginia bicycle tour in 1996. Click on the picture for more images of Ginny. 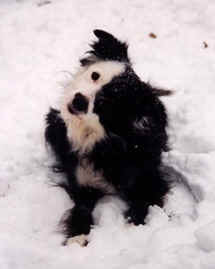 Domino was a border collie who lived to be about 15 years old and died in 2005. She had a series of strokes and recovered a little less after each one. We eventually had to put her down. 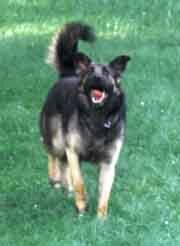 When she was younger she loved to chase and retrieve a ball. She would also go out and herd Lady back into the house on command. When you spoke to her she would turn her heard side-to-side as you can see in this picture. 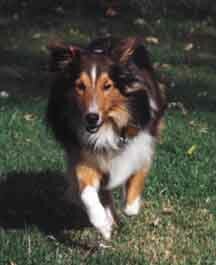 Lady was a tri-color collie. She died in 2004 at the age of 14 1/2. In her later years she had trouble with her back legs and spent most of her time sleeping. As her quality of life declined we made a tough decision to have her put down. The day before we were going to have her put down she developed bloat and we had to rush her to the vet to have her euthanized. She was always a very sweet and friendly dog. 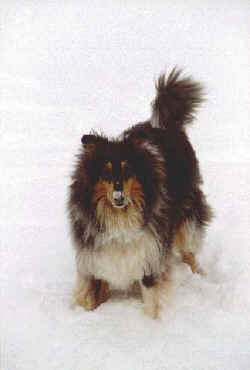 Callie was a sheltie (miniature collie). She was about two years younger than Lady. She lived with us for a few years and then lived with Alan's parents. She was a beautiful dog, but like a lot of shelties, she sometimes barked too much. She died in 2005 a few years after a bout with cancer. 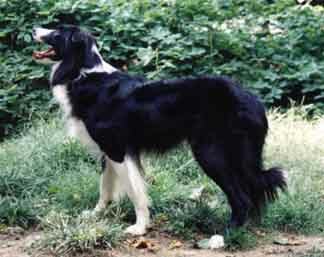 Nick was a border collie. He also lived with us for a few years before a friend adopted him. Border collies are herding dogs, and Nick was very happy to have his own little boy to watch after. Nick died in 2006. 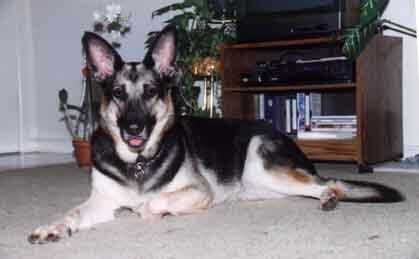 Misha was a German Shepherd. We adopted her in 1995 from Dawn's cousin. She lived with us for about a year and a half before she died suddenly of cancer at the age of 6. She was one of the best dogs we've had. She was quiet yet protective of us and the house, and she loved the other dogs. Zoe lived with us for a few months while we dog-sat for a friend. She was a mixed Shepherd / Retriever. In this picture she's playing with a stuffed bear that she liked to carry around the house. We adopted Mocha from an animal shelter in 1995 but we were only able to keep her a short time. She was an escape artist and managed to get over our fence more than once. We had to return her to the shelter where she was adopted out again, hopefully by a family with a taller fence. She was part Shepherd, part high jumper.